Where Are The Andaman Islands? This archipelago of almost 600 islands lies in the Bay of Bengal between India and Myanmar. 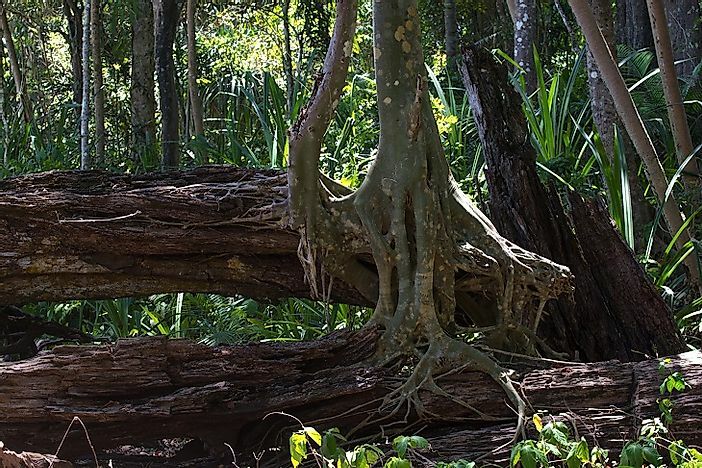 Ficus growing in the dense Andaman wilderness. The Andaman Islands in the India Bengal Bay have unique ecosystems, people, and wildlife. However, outside intrusion is destabilizing these islands culturally, as well as disrupting their flora and fauna. The Andaman Islands, numbering about 556 in total, are located over 1,000 kilometers east of the Indian mainland, in the more isolated parts of the Bay of Bengal. According to the World Wide Fund for Nature (WWF), the Andaman Islands politically belong to India, but a few on the northernmost end of the archipelago, including the Table, Great Coco, and Little Coco Islands, are Myanmar’s. Only 24 of the Andaman Islands are inhabited by endangered primitive tribes like the Great Andamanese, Onges, Jarawas, Sentinelese, and Shompens, according to Andaman and Nicobar Administration (ANA). North Andaman is 285 kilometers south of Myanmar, and the 150-kilometer wide Ten Degree Channel separates the Andaman from the Nicobar Islands. Combined, the Andaman and Nicobar Islands have the longest coastline of all Indian States, according to ANA. Documented habitation of the Andaman Islands dates back to 2200 years ago, according to the Tourism Department of Andaman and Nicobar administration (ANA). However genetic, cultural and linguistic isolation studies, purport the Andaman Islands were inhabited 30,000 to 60,000 years ago, in the Middle Paleolithic era. Throughout the ages Andamanese people led an isolated existence until 1850, when they first had contact with groups from the outside world, according to ANA. Prior to outside contact being made there were at least 10 Andamanese sub groups, and languages. The groups include the Jarawa, Onge and Sentinelese, the most isolated of those indigenous people’s groups. Annually tens of thousands of tourists visit the Andaman Islands to see its indigenous people, and the richness and uniqueness of its flora and fauna, earning it much needed foreign exchange. Various recreational activities are available for tourists like scuba diving, skiing, sailing, parasailing, wind surfing snorkeling, and others. The evergreen forests also offer scenic setting for treks and walks, and are also ideal camping locations as they are near the beaches. Besides tourism, agriculture, trade, construction, commerce, and fishing are other economic activities at the Andaman Islands. Rice, coconuts, bananas, and areca nuts are crops mostly grown there. The Andaman Islands are in one of the busiest trading routes in the world, and the Indian Navy keeps watch over the waters for sovereignty and safety sake. Andaman Islands weather is warm tropical, with temperatures ranging from 22 to 30 degrees centigrade with average annual rainfalls of between 3,000 and 3,800 millimeters. This climate sustains natural vegetation comprising of coastal and mangrove forests, interior evergreen and deciduous forests. Mangroves cover 15 percent of the Andaman Islands total land area according to World Wide Fund for Nature. This mixed flora is home to 5 endemic and near endemic mammals, which are the Andaman Shrew, Andaman white toothed shrew, Jenkins Shrew, Horseshoe bat, and the Andaman rat. The Andaman Islands also have 8 endemic, and 4 near endemic bird species. The birds are the Andaman serpent eagle, Andaman crake, Andaman wood pigeon, Andaman cuckoo dove, Andaman brown coucal, Andaman scops owl, Andaman hawk owl, Narcondam hornbill, Andaman woodpecker, Andaman drongo, Andaman treepie, and the white headed starling. The islands also have 45 reptile species and 13 are endemic and 12 amphibians of which 7 are endemic, according to World Wide Fund for Nature. Influx of mainland people to the Andaman Islands poses the most threat. Increased outside population is pressuring the islands natural resources. Logging and agricultural encroachment on forested territories incidences are rising and destabilizing this ecosystem. Invasive species introduced like rats, dogs, and cats are decimating the populations of the endemic Andaman crake. In recent years, tour trips to the naked tribes like the Onge and Jarawa have raised ethical issues. This is after issues of sexual abuse by tourists on the tribal women by foreigners after being plied with alcohol, began to be reported by western media, like the Guardian from the United Kingdom.